Geraldine Mundy was the daughter of the Rev Maurice Fitzgerald Townsend (or Townshend) Stephens of Castle Townsend (also called Castletown or Castle Townshend) in County Cork and Dingle in County Kerry and his wife Alice Elizabeth (nee Shute). Geraldine was baptised on 12th February 1829 in Thornbury. The photograph on the left shows her at Thornbury House in 1905. In many of the records the surname of the family varies. It can be shown as Townsend (or Townshend) or as Stephens. For the sake of consistency we have used the Townsend spelling here but the sources quoted use either spelling. Her father, Maurice was the vicar in Thornbury from 1823 to 1872. He was born about 1792 in Ireland and was the third son of Richard Boyle Fitzgerald Townsend MP and Henrietta nee Newenham. Maurice went to Christ Church in Oxford and after graduating, the newspaper of 4th October 1823 announced that the Rev Maurice Fitzgerald Townsend was presented to the Vicarage of Thornbury. The vicarage in Thornbury then became his home for the rest of his life. Maurice Fitzgerald Townsend married Alice Elizabeth Shute in Thornbury on 16th May 1826. Alice was described as the niece and heiress of the late H Stephens of Chavenage House, near Tetbury in Gloucestershire in the wedding announcement. The Ancestry website has some background information on Alice Shute which explains some of the later name changes of this couple and their family. The last of the the elder line of the Chavenage House family was Henry Stephens who died in 1795. His property was left to the heirs of his aunt Elizabeth Packer nee Stephens of Shellingford Manor. Elizabeth’s grandson Henry Willis inherited Chavenage and then became the Rector of Little Sodbury. Their son Henry Hannes Willis inherited the title and the name of Stephens. Henry Willis became a monk and was obviously unmarried and childless. After his death about 1822 in La Trappe in Normandy his heirs became the children of his sister Mrs Richmond Shute, first Henry Richmond Shute who died in 1823 and then Alice Elizabeth Shute. The provisions of the original will meant that the heir through the female line was obliged to drop his or her own name and adopt by Royal Licence the arms and name of the Stephens family. Maurice and Alice seem to have continued this tradition and this appears to be the reason why there is some confusion about the surname of the Townsend Stephens family. Geraldine had two siblings. Her sister was Alice Gertrude Townsend Stephens who was baptised 18th October 1830. Her brother was Henry John Townsend Stephens who was baptised 1 November 1827. Alice Elizabeth Townsend Stephens, Geraldine’s mother died aged only 28 and was buried at Castle Townsend. In the 1841 census Maurice was referred to as Maurice Stephens and he was living at the Vicarage at Thornbury with his daughters Geraldine aged 12 and Alice aged 10 and Henrietta Townsend aged 65 and Elizabeth Townsend aged 30. On October 3rd 1845 The Morning Post reported that the late Colonel Townsend of Castle Townsend in Cork, a Colonel in her Majesty’s 14th Regiment of Light Dragoons, had left the whole of his estates in England and Ireland to his brother the Rev Maurice Stephens Townsend the vicar of Thornbury. He appointed Maurice sole executor of his will and Maurice was expected to make such provision as he might think proper for his sister and young brother. In June 1848 Geraldine and Gertrude Townsend were presented by Lady Morgan at St James’s Palace to Queen Victoria and Prince Albert as was the custom for young ladies of a certain level in Society. The newspaper reported in great detail the dress she wore and its trimmings. In the 1851 census the family included Geraldine’s brother Henry aged 23 who was at that time a Guard. Geraldine aged 22 and Alice were living at the family home and not working. Their father Maurice was aged 60. On 25th March 1856 the wedding took place of Geraldine’s sister Alice Gertrude Townsend Stephens youngest daughter of Rev Maurice Fitzgerald Townsend of Castle Townsend to Rev Courtenay John Vernon Rector of Grafton Underwood. By the 1861 census Geraldine was living at home in the Vicarage at Thornbury with her father and their retinue of servants; a groom, a maid, a cook, a lady’s maid and two housemaids. On September 29th 1864 Geraldine’s brother Henry J T S Townsend of Chavenage Gloucestershire late the Life Guards and only son of the Rev Maurice Fitzgerald Townsend of Castle Townsend married Jane Adeliza Hussey de Burgh. On the 7th September 1869 Geraldine’s brother, Henry J Stephens Townsend died at Castle Townsend. He left two young sons; Maurice Fitzgerald Stephens-Townsend and Hubert de Burgh Fitzgerald Stephens-Townsend. Geraldine’s then future husband Pierrepont Mundy was born 13th August 1815 and was the sixth son of General Godfrey Basil Mundy. His first wife was a widow, Harriet Georgina Richards of Plas Newyyd , whom he married at St George’s Church in Hanover Square on 9th June 1859. Pierrepont’s first wife died 18th September 1865. Geraldine became the second wife of Major General Pierrepont Mundy on April 30th 1870 in Thornbury. The West Cork Advertiser waxed very lyrical about the bride whose “darling beauty … so bedimmed the eyes of all beholders that they could not look at anything in which her lovely little form did not occupy the first place.” The people of Thornbury had made floral arches with flags and mottos and strew flowers in honour of the occasion. In 1871 Pierrepont was staying with his widowed first mother in law and her family in Glamorgan. His sons Godfrey Harry Brydges Mundy aged 11 and Basil St John Mundy aged eight were also with their grandmother and father. In the same census (1871) Geraldine Mundy was living with her father in the vicarage in Thornbury. She was aged 32. They were living in a substantial household with a cook, a lady’s maid, a housemaid, a kitchen hand, a butler (John H T Bolton), a coachman (Henry Clutterbuck) and a footman. On 26th June 1871 “The Morning Post” reported that Major-General and Mrs Pierrepont Mundy had arrived at 16 Granville Place on a visit to the Duchess Sforza Cesarini. The couple obviously enjoyed a glamorous social life. On 21st March 1872 the Rev Maurice Fitzgerald Stephens Townsend of Castle Townsend died at the Vicarage in Thornbury. He had been vicar of Thornbury for 48 years and was aged 81. “The Times” of June 11th 1878 had an advertisement concerning a decree in chancery made in a case where John Fowler was a plaintiff and Pierrepont Henry Mundy, Geraldine Henrietta Townsend Mundy and others were defendants. The advertisement asked for people to come forward who had a claim on the estate of Maurice Fitzgerald Stephens Townsend. On the 14th April 1880 Pierrepont Mundy gave his stepdaughter Ella Richards of Plas Newydd in marriage to the Mackintosh of Moy Hall. In 1881 the census shows Pierrepont Mundy aged 65 a retired major general born in Kirk Hallam in Derbyshire and Geraldine aged 49 at Thornbury House with their servants; the butler, groom, page, ladies maid, housemaid and kitchen maid. Pierrepont’s son Basil was at school at Hyde Hall in Sawbridgeworth Hertfordshire. Pierrepont Henry Mundy died in Thornbury 16th February 1889. His will which was proved on 30th April 1889 at Gloucester left his wife Geraldine as executrix of his estate (valued at £8,284 4s 11d). On October 3rd 1892 the Bristol Mercury reported on a Tory demonstration at Thornbury to receive the return of Mr E Colston MP. Several bands including the Tockington Brass Band and the Pilning Brass Band marched to the grounds of Thornbury House lent by Mrs Geraldine Mundy the Hon. Sec. of the Primrose League. On the lawns of Thornbury House were a large number of young women dressed in white with blue sashes and evergreens were thrown in the path of Mr and Mrs Colston. In 1893 on January 12th The Standard had an article about the visit of Geraldine Mundy (ne e Townsend) to her family estate in Skibbereen in Ireland. Mrs Mundy’s carriage knocked down an old lady who had fallen in front of it and two local men apparently scolded the woman severely for frightening Mrs Mundy when she was coming home at last! Another gentleman asked to see Mrs Mundy so he could “rowll” anyone she did not like into the river! In the rate book of 1899 Geraldine was still renting Thornbury House from Sir Kingsmill Grove Key. On June 3rd 1899 Geraldine leased Thornbury Grange as it was then known to her son Basil. 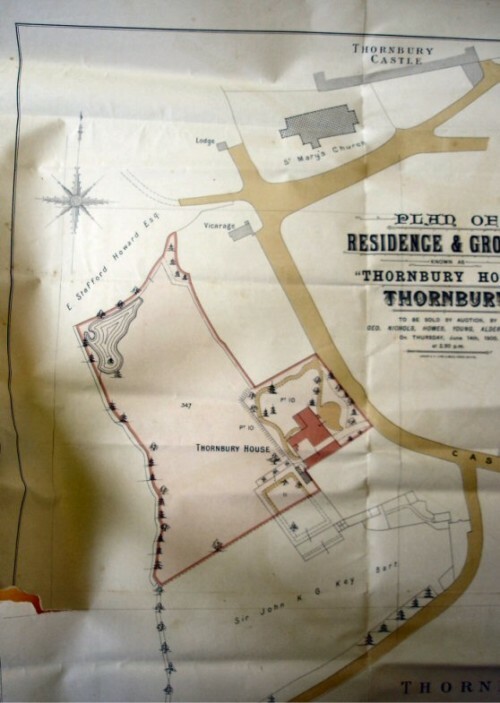 Thornbury House was put up for sale on 26th May 1900, at which time it was owned by Sir John K G Key and let to Geraldine Mundy. We have here above left a copy of the plan on the sale notice. Thornbury House was bought by Geraldine Mundy and this was confirmed in an indenture dated 6th December 1900 between her and John Kingsmill Causton Key which is in Gloucester Record Office (D3789 box 5). Also living in the house were Geraldine’s cook, maid, kitchen maid, under housemaid and housemaid. On the right hand side is a thumbnail image of the plan of the property at that time. Please click on it for a larger image. In the 1901 census Geraldine, then widowed and aged 70, was head of the household. She was living with her step-grandson Frederick Mundy aged five and his governess, Emily Ormsby aged 19. In the rate book of 1910 Geraldine Mundy owned and occupied Thornbury House but Thornbury Cottage, which she also owned, and presumably acquired in a separate transaction with Kingsmill Grove Key, was vacant and her land was being farmed by her step son Basil Mundy. In the 1911 census Geraldine Mundy was 82 years old and a widow living with her six servants. Her step-son and his family also seem to be in the house but perhaps in a separate household. Captain Godfrey Harry Brydges Mundy aged 50 had been married to his wife Rose for 21 years and they had two children, one of whom was living in the house. Second Lieutenant Pierrepont Rodney Miller Mundy was aged 19. There was another servant, a lady’s maid to Rose. Geraldine died 3rd November 1911. Probate was granted to Aubrey Paul Kitcat and Henry Privett Thurston. The estate was originally said to be £12,991 13s 9d but was later re-sworn at £15968 1s 10d and £16164 11s. By the 1918 electoral roll the owner and occupant of Thornbury House was the Hon Mrs Evelyn Mary Geraldine Gillett, the niece of Geraldine Mundy. Evelyn Mary Geraldine Vernon had married the Rev Hugh Hodgson Gillett on 7th August 1877. The South Gloucestershire Chronicle of 29th January 1915 had a report of the death of the Rev H Gillett who died at Thornbury House aged 78. He had apparently been in ill health from June of the year before. His obituary said that he came to Thornbury at the beginning of 1912 with his wife the Hon Mrs Evelyn Mary Geraldine Gillett who inherited Thornbury House estate on the death of Mrs Pierrepont Mundy in the previous November. For 37 years he was Rector of Compton near Guildford in Surrey. He left a wife, two daughters and three sons. Two of his sons were in the army at the time of his death, one was a Captain in the Artillery Regiment and the other was in “Kitchener’s Army.” Their eldest son was headmaster of a Grammar School at Winchester. Rev Gillett was buried at Compton. Hugh Hodgson Gillett was the fifth son of Gabriel Edwards Hodgson Gillett of Waltham Co. Leicester. He matriculated to Exeter College on 24th February 1854 aged 17. He graduated with a BA in 1858 and gained his MA in 1860. He was Rector of Compton in Surrey from 1877 to 1912. Evelyn Mary Vernon was the daughter of Courtney John Vernon and Alice Gertrude Townsend (the sister of Geraldine Mundy). Her birth was registered in Kettering in the September quarter of 1859. Her father was rector of Grafton Underwood and heir to Lord Lyveden. The 1861 census shows her aged one year with her parents at the Rectory of Grafton Underwood in Northamptonshire with her brother Courtney Robert Percy Vernon. Hugh Hodgson Gillett married Evelyn Mary Vernon in the September quarter of 1877 at St George’s in Hanover Square, London. The 1881 census shows that the couple lived at Compton Rectory and they already had three children two years old and younger – Hugh aged two, Sybil aged one and Charles aged eight months. The 1891 census showed Hugh Hodgson Gillett aged 54 and Evelyn his wife aged 31 were still living in the Rectory in Compton with six children; Hugh aged 12, Sybil aged 11, Charles ten, Margerie aged nine, George aged eight and Gertrude aged seven. In 1892 Evelyn’s father died and her brother as the Nottinghamshire Guardian reports “formerly well known in the dramatic world, and eldest son of the deceased, now becomes heir to the barony.” In January 1895 Northampton Bankruptcy Court heard that Percy Vernon (as her brother was known) was a nurseryman in Stanwick and his business then had a liability of £10, 568 6s 3d. In 1898 the Era publication reported that Percy Vernon was one of the cast appearing in summer season at the New Albion Theatre in Poplar in a programme of dramas and farces. The 1901 census showed Hugh Hodgson Gillett was aged 64 and his wife Evelyn was 41. Their children were Hugh aged 22, Sybil aged 21, Margerie aged 19 and Gertrude Gillettt aged 17 and their four servants. Hugh Hodgson Gillett died on 22 January 1915 probate was to Hugh Vernon Gillett and George Maurice Gerald Gillett. His effects were £2529 17s 5d. A memorial to him is in the Stafford Chapel of St Mary’s Church in Thornbury. Mrs Gillett appears to have moved to Thornbury with her husband around 1912 and the 1925 Valuation List shows that she remained in Thornbury House, which she owned along with Thornbury Cottage. In 1917 The Gazette announced the wedding of Gertrude Mary Gillett younger daughter of the late Hugh Gillett and the Hon. Mrs Gillett of Thornbury House to Luke Turner the son of the late Mr Luke turner of The Fosse in Leicester. Molly Cotter, the daughter of the then vicar Claud Cotter, remembers Mrs Gillett very well. Apparently she had a big tennis court and gave tennis parties when her younger relations were visiting her. Molly recalls that Mrs Gillett became quite well known in Thornbury for one thing. She was troubled by the fact that she had so much lawn to be mown and decided the best way to deal with it was to keep guinea pigs on it who would multiply and keep the grass to an acceptable level. This horticultural experiment was not a success. Mrs Gillet’s brother Courtenay Robert Percy Vernon, the third Baron Gillett was made bankrupt in 1920. Mrs Gillett died on January 28th 1930 at Thornbury House aged 70. She was described as the widow of Rev H H Gillett and sister of the third Baron Lyveden. Probate was granted to her children, Hugh Vernon Gillett and Gertrude Mary Turner (a widow). Her effects were £1913 6s 11d. Her obituary in the Western Daily Press of 1st February 1930 said that Mrs Gillett until her illness fourteen months earlier had been a very active member of the parish church. Hugh Vernon Gillett was born 12th June 1878. On February 6th 1897 Hugh, then described as of Winchester College gained a How Exhibition scholarship to Exeter College Oxford. In the 1901 Census aged 22, he was a student at Oxford, where he later gained a second class Honours Degree in Jurisprudence. Charles Richard Gillett was born 24th August 1880. He was Lieutenant R A and Instructor in Gunnery at Malta. He married Gwynne daughter of Robert Keate of 14 Roswell Gardens on 8th February 1906. A photograph of Charles Richard Gillett appeared in the Thornbury Gazette of 1915. It is shown here on the left. George Maurice Gerald Gillett born 17th November 1882. His name appears on the World War One Memorial in Thornbury. He was killed in action when a shell exploded on September 26th 1916 aged 33. He was Captain of the 6th Leicesters. He was made a Lieutenant in December 1915, having been in a public school corps. He was described as the son of the late Hugh Gillett and Hon Mrs Gillett of Thornbury House. We apologise for the very poor quality of the photograph on the right but it is the only one we have of George Maurice Gillett. An article in the South Gloucestershire Chronicle of October 20th 1916 said that George attended St Edward’s School in Oxford and entered the Bank of England. Apparently he was a partner in a Leicestershire firm from 1912 until he enlisted. Sybil Evelyn Gillett married Captain Gerald William Daman of the Royal Fusiliers. Gertrude Mary Gillett. The Western Daily Press of March 1st 1917 reported on the marriage of Gertrude Mary the younger daughter of the late Rev Hugh Gillett and Mrs Gillett of Thornbury House to Luke Turner son of the late Luke Turner of The Fosseway Leicester. By 1931 Hugh Vernon Gillett the son of Evelyn Mary Gillett was shown in the electoral roll for Thornbury House. He also appeared in the 1935 traded directory and the electoral roll of the same year. The Western Daily Press of 29th June 1935 advertised Thornbury House and the lands belonging to it for sale. The sale was “at the direction of H.V. Gillett esq.” Please click on the thumbnail image above to read the advertisement. Hugh Vernon Gillett died in the Tonbridge District in 1956 aged 77 years.